Why do I need an adapter? For some motorcycle models an additional adapter might be necessary for a reliable and safe Scottoiler installation. Should an adapter be required you will find the information in the product compatibility section of the model-specific guide. If no additional adapter is mentioned you are all set for the installation on your bike. From January 2019 on we have updated the contents of all 3 products: the vSystem, xSystem and eSystem. All 3 products now come with the new Multiform Dispenser that makes the installation of the dispenser on the swingarm super easy. A lot of adapters are not required thanks to this new solution. vSystem - if your vSystem box has the yellow triangle sticker on the box the Multiform Dispenser is included in your system. 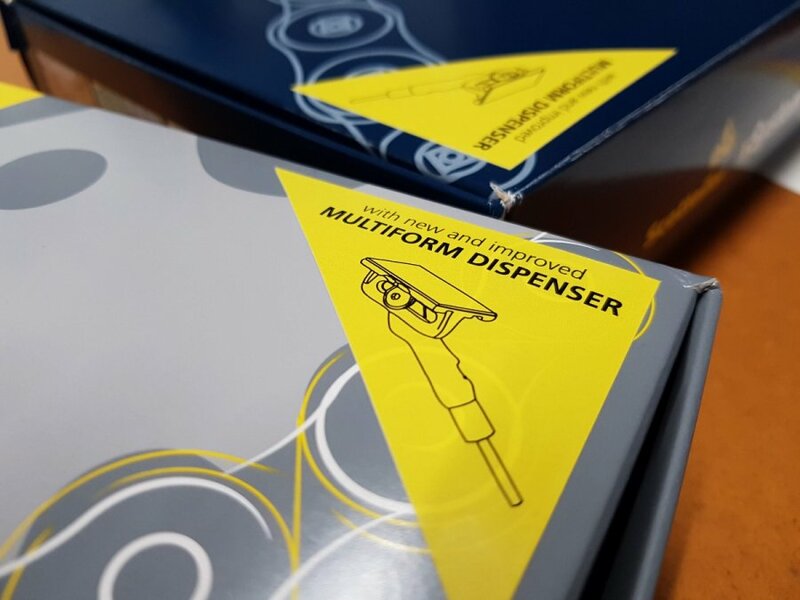 eSystem - if your eSystem box has the yellow triangle sticker on the box the Multiform Dispenser is included in your system. xSystem - the xSystem had the Multiform Dispenser included from the product launch so you will not require any adapters. The installation adapters are FREE if you are buying a Scottoiler system or accessory and the part is required for installation. Your Scottoiler dealer or workshop should have stock of most adapters and will be happy to supply you with any adapters. If your workshop does not have the adapter please contact Scottoiler and we will help you out. Spare/replacement adapters can be purchased from your Scottoiler re-seller. Your Scottoiler re-seller and workshop will have a number of installation adapters in stock. Check the model-specific installation guides before buying and ask your Scottoiler dealer to add the installation adapter to your order. That way you can start straight away with the installation. If you have any other questions or problems please do not hesitate to get in touch with us.